So, I obviously didn't post last week, because I had some big stuff happen. Check back in Friday for the exciting news! In the meantime, here's a post from Alexa. Thanks so much for having me, Krissy! Greetings, readers of Words in my Soul! 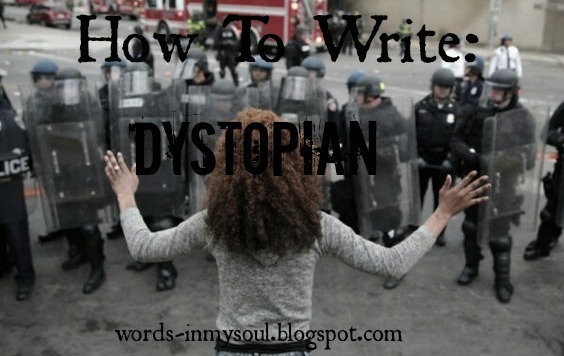 I am Alexa *bows* here to offer a few do’s and don’ts for writing the suddenly-very-popular genre that is dystopian fiction. First off, I’d just like to say that I am not an expert by any means and basically have no idea what I am doing. But! These are a few tips I’ve collected and invented as my co-writer and I hash out our little dystopian project, and I think they’re all pretty solid. The tips, I mean. Though the project and my co-writer are pretty cool too. If you want to not-so-subtly hint at how horrible everything is in your society, then bring in this special ceremony/terrible thing that happens when teenagers come of age, culminating in an epic battle where everyone must RISE UP for freedom, that’s perfectly fine. But there are a lot of books like that, I mean, a lot of a lot, and since people are always searching for something unique, I think the most important thing in writing dystopian is to take that common storyline and make it your own. Add a fantastical element here, flip the whole world on its head there, you could even toss out the “epic battle” if you want to, depending on how you’ve formulated the action so far. Consider making the classic teen-girl protagonist the antagonist, or having the villainous society actually be the hero; just whatever you do, make it new. If you develop your world enough, you truly explore the backstories and the complicated nuances of your society, carefully crafting it into something strong enough to suspend your reader’s disbelief, your story will most likely follow suit and begin to evolve into something unique and amazing. To be perfectly honest though, I’m not stellar at worldbuilding. I’m very good at random-ideas-in-the-middle-of-the-night-or-while-washing-dishes worldbuilding, but thorough, systematic development of an entire world system? Not something that comes easily for me, at least not without prompting, and there were a lot of dystopian factors in our storyworld that I was just taking for granted without actually exploring what might be behind them or how they could be better. This is not to say that you should kidnap a bunch of teenagers and force them at gunpoint to act out the situations living in your psychotic head--while incomparably good for research, which I obviously do not know from personal experience, kidnapping, coercion, etc, etc, is all somewhat illegal. No, what I mean is to develop your characters the same way you develop your storyworld--carefully and thoroughly. Spend time with your charries, daydream about them, take some situation in your life and consider how the babies might react to it. Figure out who they are, why they’re that way, and make sure they stay true to themselves (not to say that they shouldn’t change at all, but for the love of the SS Katniss and Peeta, PLEASE do not have your sassy, street-smart, kickbutt dystopian hero suddenly have his/her brain melt and leak out of their ears the moment they lay eyes on their soon-to-be significant other. Please). Yeah. So I spend the whole post telling you to just create your own world and do your own unique thing--then for my last tip, I turn around and say to study the genre. Well, I think it’s a good idea so that you can figure out, one, what you could emulate (not plagiarize), and two, what’s already been done and what material you have to put your own unique spin on. Hunger Games: simply because it is so popular, and if you want to make it big in this genre, it might be good to know what everyone is raving about. The Always War: Not my favorite dystopian, but it is interesting, it’s not particularly violent, and it’s also unique to its genre. A good starter, if you haven’t read a lot of dystopians before. When she was little, all Alexa wanted was to be an artist, but she realized later that being a writer is an art in its own right. Besides, everyone knows it’s way easier to write a few paragraphs than to copy the Mona Lisa. Well, she thought it would be anyway. Then she tried editing fifty thousand words and started to rethink that Mona Lisa thing. You can find Alexa on Pinterest, Goodreads, Fanfiction.net, and her blogs, Summer Snowflakes and Verbosity Book Reviews.